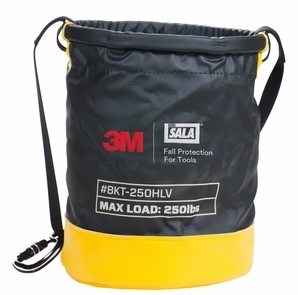 Every 3M� DBI-SALA� Safe Bucket is manufactured with either a hook and loop or drawstring closure system which helps prevent accidental drops. This Safe Bucket is equipped with an innovative closure system that features a "Lockdown" mode and "Easy-Access" mode. When green tabs are lined up on the closure system, the bucket is in Easy-Access mode, and is easily opened by an end user. When red tabs are lined up, the bucket is in Lockdown mode and is less prone to accidental opens. Sewn into the bottom of every Safe Bucket is hard composite plating that protects the bucket from accidental punctures. A protective leather sleeve covers the inserts that is resilient to the elements and harsh work environments. The Safe Bucket was engineered to be used with tools at height, and includes six connection points that can be tethered to. Workers can tether their tools directly to the Safe Bucket when being used, and store their tools for transport when finished. Constructed from a heavy-duty vinyl material that is suitable for harsh work environments and easy to clean. Instead of rope which is susceptible to fraying, a heavy-duty hoisting/shoulder strap is built into every Safe Bucket. Each bucket is also equipped with a high-quality and lightweight aluminum twist-lock carabiner load rated for 30 kN (6,700 lbs). There is no need to worry about a knot failing, or a non-locking carabiner which may slip off a connection point.